A new method for equine performance assessment has been tested on vets. Conducted by Dr Sue Dyson, Head of Clinical Orthopaedics at the Centre for Equine Studies at the Animal Health Trust in Newmarket, the study assessed how accurately vets may be able to use an ethogram1, developed by Dr. Dyson, to assess pain in ridden horses. The participating vets collectively commended the value of the ethogram, which defines 24 ridden behaviours that may reflect pain and lameness. The study was conducted at World Horse Welfare’s centre in Norfolk on 21st July. Twenty horse and rider combinations, together with a range of professional practitioners, volunteered their time to support the study, which has the potential to transform the welfare of ridden horses. Initially the horses were assessed by Association of Chartered Physiotherapists in Animal Therapy (ACPAT) physiotherapist, Jo Spear. The back was examined to check for any areas of muscle tightness or discomfort. Society of Master Saddlers (SMS) Saddle Fitter, Liz Suddaby, checked the fit, placement, balance and suitability of each horse’s saddle. The horses were then given a 15 minute ridden warm-up before executing an 8-minute purpose-designed dressage test. During the dressage test a team of 10 equine vets, selected from 40 volunteers, scored each horse for the presence of 24 behaviours that may reflect pain. The tests were filmed so that Dr. Dyson could make a comparison between her own real-time behaviour assessments and video analysis and so that the rider skill level could be scored retrospectively by Dr Anne Bondi BHSI. 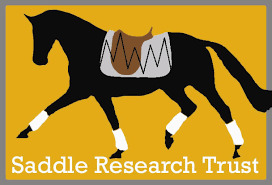 To find out more about the Saddle Research Trust Conference on Saturday 8 December 2018 and to buy tickets, visit www.srt2018.com or call 07948 303281.